The particle size distribution, or gradation, of an aggregate is one of the most influential aggregate characteristics in determining how it will perform as a pavement material. In HMA, gradation helps determine almost every important property including stiffness, stability, durability, permeability, workability, fatigue resistance, frictional resistance and moisture susceptibility (Roberts et al., 1996). In PCC, gradation helps determine durability, porosity, workability, cement and water requirements, strength, and shrinkage. Because of this, gradation is a primary concern in HMA and PCC mix design and thus most agencies specify allowable aggregate gradations for both. Maximum size. The smallest sieve through which 100 percent of the aggregate sample particles pass. Superpave defines the maximum aggregate size as “one sieve larger than the nominal maximum size” (Roberts et al., 1996). Nominal maximum size. The largest sieve that retains some of the aggregate particles but generally not more than 10 percent by weight. 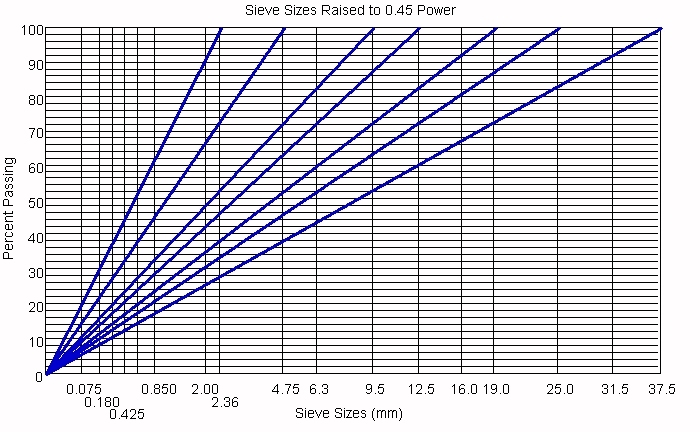 Superpave defines nominal maximum aggregate size as “one sieve size larger than the first sieve to retain more than 10 percent of the material” (Roberts et al., 1996). Thus, it is important to specify whether “maximum size” or “nominal maximum size” is being referenced. Gradation has a profound effect on material performance. But what is the best gradation? This is a complicated question, the answer to which will vary depending upon the material (HMA or PCC), its desired characteristics, loading, environmental, material, structural and mix property inputs. Therefore, gradation requirements for specific HMA and PCC mixes are discussed in their respective pavement type sections. This section presents some basic guidelines applicable to common dense-graded mixes. Provide adequate volume for the binder (asphalt binder or portland cement) to occupy. Promote rapid drainage and resistance to frost action for base and subbase courses. In the early 1960s, the FHWA introduced the standard gradation graph used in the HMA industry today. This graph uses n = 0.45 and is convenient for determining the maximum density line and adjusting gradation (Roberts et al., 1996). This graph is slightly different than other gradation graphs because it uses the sieve size raised to the nth power (usually 0.45) as the x-axis units. Thus, n = 0.45 appears as a straight diagonal line (Figure 1). The maximum density line appears as a straight line from zero to the maximum aggregate size for the mixture being considered (the exact location of this line is somewhat debatable, but the locations shown in Figure 1 are generally accepted). Figure 1. Maximum density curves for 0.45 Power gradation graph each curve is for a different maximum aggregate size). To illustrate how the maximum density curves in Figure 1 are determined, Table 1 shows the associated calculations for a maximum aggregate size of 19.0 mm. Refers to a gradation that is near the FHWA’s 0.45 power curve for maximum density. The most common HMA and PCC mix designs in the U.S. tend to use dense graded aggregate. Typical gradations are near the 0.45 power curve but not right on it. Generally, a true maximum density gradation (exactly on the 0.45 power curve) would result in unacceptably low VMA. Refers to a gradation that contains only a small percentage of aggregate particles in the mid-size range. The curve is flat in the mid-size range. Some PCC mix designs use gap graded aggregate to provide a more economical mix since less sand can be used for a given workability. HMA gap graded mixes can be prone to segregation during placement. Refers to a gradation that contains only a small percentage of aggregate particles in the small range. This results in more air voids because there are not enough small particles to fill in the voids between the larger particles. The curve is near vertical in the mid-size range, and flat and near-zero in the small-size range. Refers to a gradation that contains most of the particles in a very narrow size range. In essence, all the particles are the same size. The curve is steep and only occupies the narrow size range specified. Note that the restricted zone will be eliminated by late 2002. The restricted zone refers to a particular area of the FHWA’s 0.45 power gradation graph associated with Superpave mix designs. It was originally observed that mixes closely following the 0.45 power maximum density line in the finer gradations sometimes had unacceptably low VMA. Therefore, in an attempt to minimize this problem, Superpave included a restricted zone through which a typical gradation should not pass as a recommended guideline. 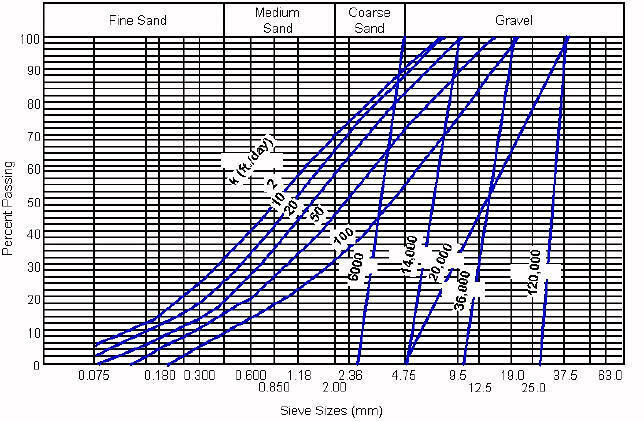 However, since the restricted zone’s original inception, NCHRP Report 464 The Restricted Zone in the Superpave Aggregate Gradation Specification has concluded that “…gradations that violated the restricted zone performed similarly to or better than the mixes having gradations passing outside the restricted zone; therefore, the restricted zone requirement is redundant for mixes meeting all Superpave volumetric parameters…It has been recommended to delete references to the restricted zone as either a requirement or a guideline from the AASHTO specification (AASHTO MP 2) and practice (AASHTO PP 28) for Superpave volumetric mix design.” (Kandhal and Cooley, 2001). A gradation that, when plotted on the 0.45 power gradation graph, falls mostly above the 0.45 power maximum density line. The term generally applies to dense graded aggregate. A gradation that, when plotted on the 0.45 power gradation graph, falls mostly below the 0.45 power maximum density line. The term generally applies to dense graded aggregate. Figure 3 shows some typical aggregate gradations and their associated permeabilities. This shows that even a small amount of particles passing the 0.075-mm (#200) sieve results in very low permeability. Therefore, for base and subbase aggregates where permeability is important for drainage and frost resistance, many agencies will specify a maximum percent-by-weight passing for this sieve. Number in parentheses indicates the allowable deviations (± ) from the target value. These are only representative gradations and do not represent a comprehensive list of FHWA specified gradations.